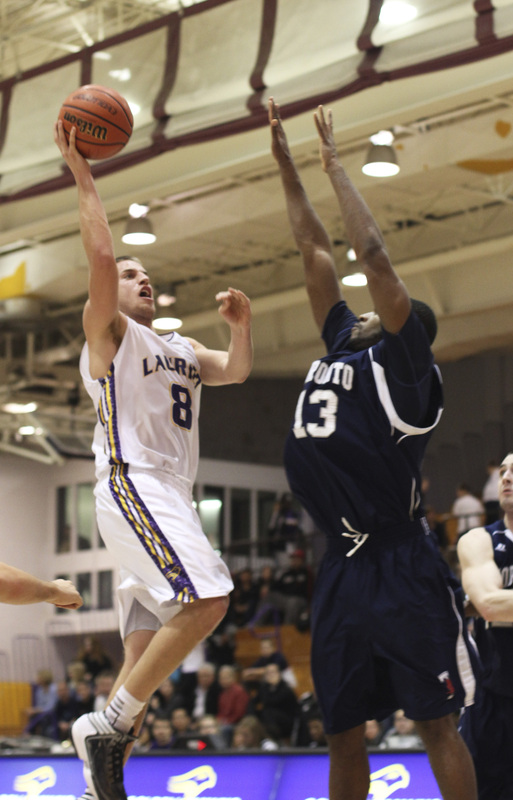 A dramatic overtime win on Friday and a hard-fought loss on Saturday left the Wilfrid Laurier Golden Hawks men’s basketball team with a split weekend. Despite a nail-biting 85-78 overtime win against the University of Toronto on Friday, the Hawks just couldn’t handle the Ryerson Rams on Saturday, losing 81-66. Saturday’s game got off to a low-scoring first half ending 29-28 for Ryerson with neither team letting the other get ahead by more than four points. Things heated up after halftime, however, as both teams would net over 20 points each in the third to keep things tight, but it was all Ryerson in the fourth as they out-scored the Hawks 29-18 in the quarter, cruising away to an 81-66 win. Those games were also an opportunity for some new faces to make a splash at home. In their home opener on Friday, a missed free throw by Toronto in the dying seconds of the fourth took the game into overtime. William Coulthard led the team to victory with a career-high 29 points and five three-pointers, while Max Allin and Patrick Donnelly had 23 and nine points respectively. Veteran leadership became prominent to the team’s success and the Golden Hawks looked to Allin for that. “[Allin] struggled a bit with his shooting and they did a good job defending him, but he’s tough,” said Campbell. “He played hurt, but he still played big minutes for us which was great. He’s the best rebounder we have defensively and offensively, he makes big shots, he’s a great player and great leader. Allin led the team with 18 points and 15 rebounds for his third straight double-double on Saturday, coming just short of a triple-double on Friday. Although the Hawks didn’t shoot the ball as well as they needed to to secure a win over Ryerson, it isn’t the only thing they’ll look to improve on for next weekend. According to Campbell, it’s still early in the season and he knows that they can only go up from here. “The kids play hard and they’re going to get better as the year goes on,” Campbell said. Laurier will look to even out their record on Nov. 23 at 8 p.m. as they face the York Lions in Toronto.